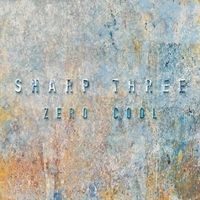 Sharp Three put a wide mix of music together on their album, Zero Cool. Surpassing the quotidian jazz clichés about "moments" and "hipness," this album possesses sonority where even the stoniest non- emotes hear spirituality, Sharp Three provide music with enough cultural variation to lose self in parts or whole. There are 9 generous tracks on the album, each conjures a new landscape, and the facility of the brother team of Goh and Kai Kurasawa on "probably all touch-style instruments in the known universe" is far beyond experimental, (the extreme 24-string Beartrax sound being one of the many). Chuck van Haecke augments the trio with a graceful and rock-ready palette of beats. There is a strong flux of rock on the album "Boom!" is dedicated to Kurosawa band-mate and trumpeter, Daniel Rosenboom, it's a catchy, upbeat blaster, worthy of a late-night talk show live band intro. "Nina" and "Lovely Youth Square" are pretty intense rock, with some edgy distorted angles. Other tracks include the Zen introspection of "Away," and once or twice, as in "Lullaby for the Content" and "Believe" just a lil'bit country (many countries). There is some elegant Brazilian samba in "Danza Samba Ganva" and a touch more drama in the flamenco closer, "Chikara." Often young guitarists seem honor-bound to "plough the same furrows as Pat Metheny or blur in the Purple Haze of Hendrix," Sharp Three are their own voices, with mastery of prior greatness and a 'now' liveliness that captures a calm, fresh sound. Sharp Three's album Zero Cool comes Kelvin approved. Track Listing: Away, Boom!, Danza Samba Ganva, Lullaby for the Content, Believe, Nina, Purple Monk, Lovely Youth Square, Chikara. Personnel: Goh Kurosawa “Musical Wakonyosai”: sitar-guitar, electric guitar, flamenco/classical guitar; Kai Kurosawa “Bass Extremist”: touch-style instruments, 6-string bass, ukelele bass; Chuck van Haecke “The Chuckernaut”: drums, percussion.